A new paper, published online June 10 in the journal Science Advances, details a comprehensive map of artificial sky-brightness across the world. Here, the data for North America are overlaid on a map from Google Earth. Light pollution photographed over California's Joshua Tree National Park. Light pollution shown for Europe, Africa, the Middle East and India using data from the newly released world atlas of artificial night-sky brightness. 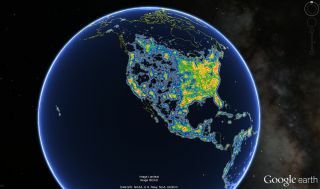 Light pollution shown for the Americas using data from the newly released world atlas of artificial night-sky brightness. Light pollution shown for Asia using data from the newly released world atlas of artificial night-sky brightness.